Our Reactor & Vessels are fabricated as per the standard codes for designing, fabricating, inspecting, testing and operations of pressure vessels. These are manufactured using boiler quality stainless steel, mild steel, aluminum, MSRL and MS lead bounded vessels. 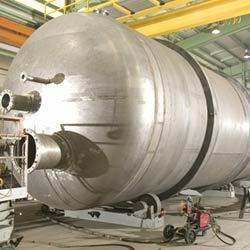 Our vessels and reactors are available in various sizes & shapes, and have the maximum capacity around 100 KL. With years of experience, our organization has been able to gain a competitive edge over others in the market. We offer a quality range to our clients, which includes Chemical Processing Equipments, Industrial Heat Exchangers, Industrial Tanks, Heat Exchanger, ISO Tank Container, Reactor & Vessel, Flaker Drum Dryer and Agitator Filter Nutch. In addition to this, we also offer Ribbon Blender and Tripper Body. Our range is known for its various features such as high tolerance, resistance to corrosion and abrasion, efficient performance and resistance to extreme weather conditions. In addition to these, we also offer techno-commercial services in the field of marketing all types of foods, chemicals & industrial engineering items for various applications. All our products are manufactured in compliance with the set industry standards, as per the varied demands and requirements of our clients. We have a team of professionals which checks the entire range at each level of production. Our manufacturing unit is equipped with various advanced technology machines such as slotting machines, profile cutting machine, 200 ton hydraulic press machine, 25 ton hand press machine and pipe bending machine with standard die. These machines help us to meet the varied demands and requirements of our clients spread all across the world. Some of our esteemed clients include Aatri Industries Ltd., Alchems Organis, Shakti Organic Ltd., R.K. Phosphate and Northern Chemicals. Our trading unit also supports our various marketing operations which involve trading of various foods, chemicals and industrial engineering items. This unit is involved in representing and marketing the products of a number of Indian flagships among international manufacturers and traders.